Preheat oven to 200°C and spray a baking tray with oil. Place pumpkin slices on a baking tray and roast, uncovered, until the pumpkin is tender. Spray a square cake pan or lasagne dish with oil and line the base and sides with baking paper. Whisk eggs with milk, nutmeg, pepper, garlic and oil. Layer half of the pumpkin in the pan, top with spinach then remaining pumpkin. Pour the egg mixture over the pumpkin and spinach and sprinkle with cheese. Bake, uncovered, for about 25 minutes or until firm. Stand 5 minutes before slicing. Nutrition information (per cup): kilojoule 1055, calories 253, protein 16g, fat 16g, saturated fat 4.5g, carbohydrate 10.5g, fibre 2g. 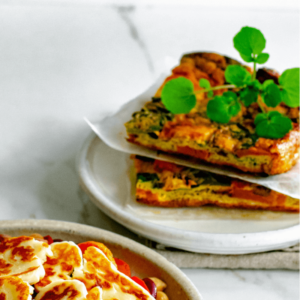 This Pumpkin and Spinach Frittata is one of the most popular recipes in Your Complete Guide to Nutrition for Weight Loss Surgery. Inside you will find over 100 tasty recipes to help you on your journey. Find out more here.